These renaissance lady's slippers lend an air of elegance and comfort. 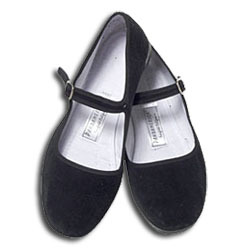 Cotton velvet uppers with a lightly padded sole and plastic lower. Light and easy, and they are even machine washable! Sold in European sizes. Please see sizing chart below.